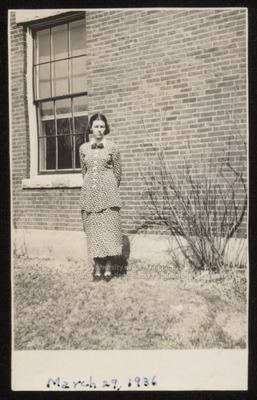 Westbrook Junior College student, Frances Savage (Taylor), stands, hands behind her back, against an outside brick campus wall in this sepia toned candid snapshot labeled March 29, 1936, on the front. Frances wears a dark and light figured skirt with a long matching top. A white collar with a dark bow and white buttons adorn the long-sleeved suit top. Frances's hair is parted in the middle, curled at the ends and pulled back behind her ears. She looks seriously and directly at the camera.